Sidney by the Sea is just 10 minutes up the road from our place. On a clear and chilly Sunday evening we bundled up with scarves, gloves, parkas, and boots for the annual parade. It's Sidney's annual parade, but our first. We tend to be stick in the muds homebodies, finding plenty to keep us occupied at home. When we do exert ourselves and get out of the house, we usually have a great time. This was no exception. Bright lights, happy people, and fun displays entertained us well, and helped us forget that our feet were beginning to freeze to the sidewalk. A cup of hot chocolate also helped. After the parade on Beacon Avenue, we wandered down to the waterfront to watch another parade, this one of lighted boats. How jolly it all was. And cold. We came home, sat by the fire, ate pizza and watched an episode of Midsomer Murders. Very cozy. Are you a stay-at-home kind of person, or do you attend a lot of community events? Do you get out more at Christmas than at other times of the year? Lorrie, we are definitely in the boring stay at home camp! We paid a whirlwind visit to a local Fete de Noel yesterday after our beach walk then it was home, log fire, baking, reading and football on TV for the rest of the afternoon. Bliss. Oh, I love it! Lights reflecting on the water is so festive! What a wonderful outing. We are very stay at home people now, and enjoy time talking, reading and discussing life in general. When we do have a day out it is great, we catch up with friends , maybe have lunch out.....but keep well out of town near Christmas. There was a Christmas Parade in Perth last week, but I wasn't going to drive 2 hours for that. One of these days I would love a cold wintery Christmas! I love the look of those boats all done up in Christmas lights. I wish they would do that on our waterfront. Stay warm and have a fabulous week. Very few community events for me...it's cold out there...but there was a time when I enjoyed the community events very much. Love those green lights against that blue sky! We tend to socialize and attend community events more around Christmas than any other time of year. 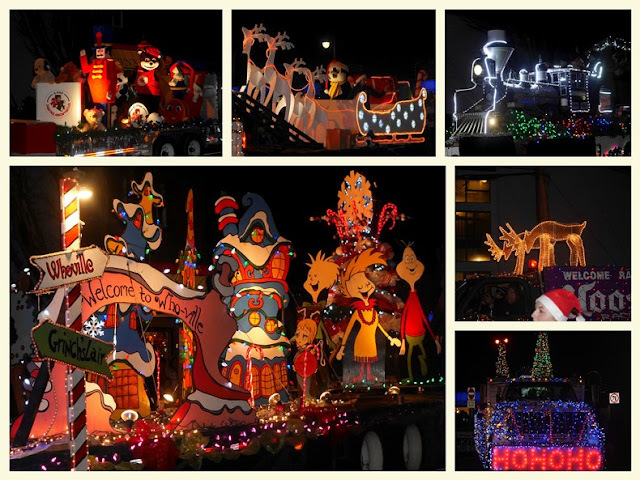 The boat parade with the dancing reflections looked amazing. Oh Lorrie what glorious holiday fun!!! I truly adore lovely seasonal lights. Having just finished up my latest round of college finals I do hope to get out a bit for some holiday cheer. Blessings of the season to you! I bet this was a lot of fun -- even in the cold. Loved the reflection of the lights on the water. For me, the holiday season kicks off officially with the holiday lights at the zoo. Otherwise, I stay at home with the kitties except for the occasional college basketball game. Happy Monday and a Merry Merry Merry! I prefer to go out in the morning, get things done and then get home so I can be a stick in the mud. That means I don't attend many things at night. I don't feel like I'm missing out because I am definitely a homebody. I do have to force myself out the door at times. Looks like you had a lovely evening despite the cold. Happy holidays! It must be the older we get the more staying at home seems a good thing. And I'm finding myself asking, how early can I get in my pjs? We do have fun when we go out, especially when it involves something with the grands, but home is good too. We can remember with gladness all that we used to do! We are definitely home cozies. Thanksgiving and Christmas events get us out the door more than other times of year. I do like to see the lights at Christmas time. The last sentence is my kind of fun! I'm definitely a homebody and go into hibernation mode during the winter! The parade looks fun. I heard that the world's biggest Christmas light maze opened recently in Vancouver. Hubby and I are pretty much homebodies too, go out occasionally but like to get back home. A symphony orchestra rented our church last December for a Christmas concert and liked the acoustics so much they're back again in a couple of weeks....that's our big outing! 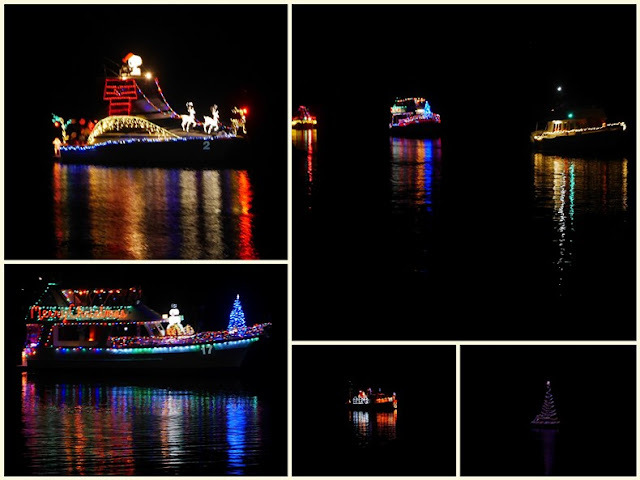 I would have enjoyed the lighted boat parade but sure hate to be cold. Oh I love seeing this parade. All the lights do delight me. We do try to get out a little, but there is too much to take in when we get out. No time to see it all. We always go to a Christmas concert a few days before Christmas. This coming weekend there are 6 things on my calendar, oh NO! Too much. But I do love it so. Enjoy! Boat parades are fun in Florida too ... and warmer. The land parade looks great too. As I am sitting in an airport waiting to board a delayed flight I can't very well claim to be a homebody. But honestly we do like staying home too. Wherever home may be. We do like to get out around the city and our close by community (which BTW is almost a small city itself with so much building going on!) to enjoy holiday happenings. Sat. afternoon we attended the annual Moravian Church Candle Tea and local high schools Christmas concert - always a favorite. Sun. afternoon I took granddaughter and daughter to see Cinderella on stage - fabulous and funny! Now we are concentrating more on packing again as we'll be leaving for Europe on Sat. Never a moment to relax around here BUT on that ship I plan to get some rest during the 'at sea' days, haha! Oh that looks like fun. Love the reflections of the colored lights. MMMmm hot chocolate sounds yummy. Great Christmas lights! I am more a stay-at-home person - for I love books!!! Enjoy your day. I tend to have my feet in both camps. Love time at home, but if I make the effort to go out, I generally enjoy myself. Beautiful collage of pictures of the reflection of the lights on the water. Homebodies here all around!! But, it is worth it once in awhile! Mostly life forces us out. This does look fun and festive. I am on the road so much for work that I cherish every second I can be home. The parade looks wonderful, I would certainly be tempted to venture out to see it. We are both. We sometimes like to stay in and sometimes off we go! Our kids help us keep on the move, as we want to ensure that their growing up years are full of good memories!